Tag line: "THE MASSACRE MEN - They carry their hate in their holsters and a name on every bullet in their belts..."
I’m always on the lookout for a good Spaghetti Western, and at first glance, 1966’s Massacre Time (aka The Brute and the Beast) had all the makings of a great one. 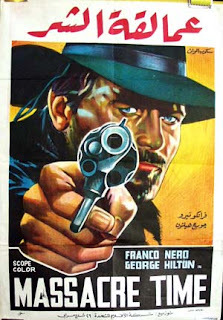 Starring Franco Nero, fresh off his success in Sergio Corbucci’s Django, Massacre Time was also directed by Mr. Lucio Fulci, who, in later years, would leave his mark on the horror genre with classics like Zombie and The Beyond. Nero stars as Tom Corbett, a gold prospector who receives a message from his old friend, Carradine (John Bartha), to return home at once. It seems Tom’s alcoholic brother, Jeff (George Hilton), who took control of the family farm after the death of their mother, sold the property to a man named Scott (Giuseppe Addobbati), who then proceeded to take over the entire town. What’s more, Scott’s son, Junior (Nino Castelnuovo), is a psychotic who enjoys bullying the locals, for no other reason than it tickles his fancy. While Tom is searching for answers, trying to figure out who the Scotts are, Jeff is busy getting into bar fights and drinking tequila by the gallon. But when the Corbett’s longtime maid, Mercedes (Rina Franchetti) is gunned down in cold blood, Jeff finally puts the bottle aside and helps his brother in his standoff against the Scotts. 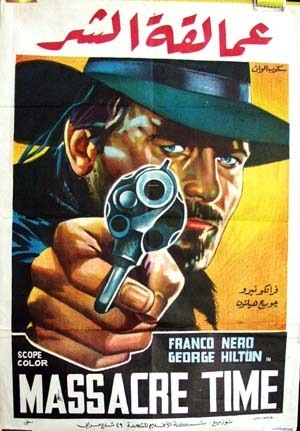 Written by Fernando Di Leo (director of The Italian Connection), Massacre Time is a gritty, violent western, and we get an idea of just how violent its going to be in the opening scene, where Junior is hosting a hunt with one of the townsfolk as the prey (the poor victim is eventually mauled by a pack of dogs). Shortly after, we’re treated to a raucous barroom brawl, with Jeff facing off against some of Scott’s men. As bar fights go, this one gets pretty nasty, and plenty of blood is spilled (Jeff is nearly beaten to death before Tom finally steps in to help). Nero does a fine job as Tom, infusing the character with a quiet strength, but of the two Corbetts, its brother Jeff (boisterously portrayed by Hilton) who’s most handy with a gun (in full gallop, he takes out six of Scott’s men). Quality-wise, I wouldn’t go so far as to rank Massacre Time alongside Django or Leone’s “Man with No Name” trilogy, but it’s definitely an entertaining western, with tons of action and even a bit of mystery thrown in (why are the Scotts so interested in Tom?) And while it’s not nearly as gory as some of Fulci’s later work, the movie has a high enough body count to keep the director’s fans happy.